Earrings Sterling Silver. Czech Glass. Modern Boho Minimalist. Reclaimed Eco Contemporary Everyday. Sleek, elegant and simple in design, these sterling silver earrings will be your everyday choice. Czech glass beads catch the light beautifully for just a touch of shine and sparkle. 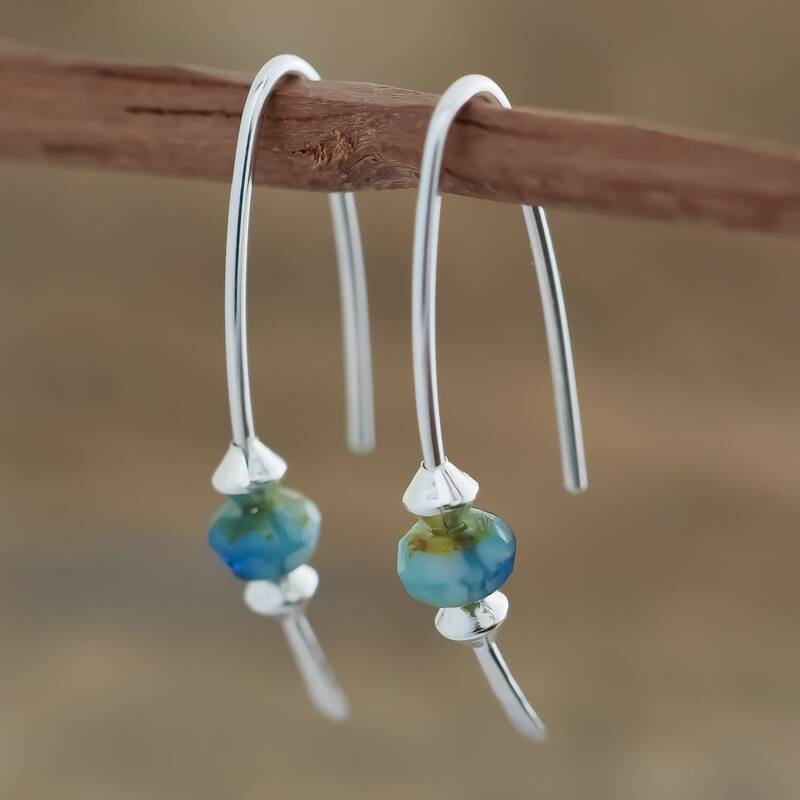 Surrounded each side by sterling silver beads, it gives a finished look to these eco handmade earrings. These handmade earrings are created in my own unique organic style and texture, inspired by a life of nature and simplicity. All Wild Forest Studio creations are handcrafted using reclaimed, recycled sterling silver. Leaf Hoop Earrings. Polished Sterling Silver. Minimalist Jewellery. Oval Hoop Earrings. Sterling Silver. Hammered Hoops. Minimalist Jewellery. Oxidised Silver. FREE SHIPPING Australia Earrings Sterling Silver. Czech Glass. Modern Boho Minimalist. Reclaimed Eco Contemporary Everyday. Reserved Listing for Deb. Please only purchase if you are Deb. Reserved Listing for Deb. Please contact me if you have any questions about your order. The time I need to prepare an order for shipping varies. For details, see individual listings. If your order has not arrived within these time frames, please let me know. It's best to wait a further 2 weeks to be sure, then we can discuss how to proceed. Buyers are responsible for any customs and import taxes that may apply. I am not responsible for delays due to customs. Please check the policies of your home country. PLEASE visit your local jeweller to find your correct measurement in US sizes before placing an order. Select your size carefully as resizing fees apply per item. It is not possible to resize all items. Resizing, if required, will be considered on a case by case basis only - please contact me for further details. Resizing fees start at $25. Shipping costs both ways will be the customers responsibility. For Stockists, Trade and Custom orders please feel free to contact us directly. Oval Hoop Earrings. Sterling Silver. Hammered Hoops. Minimalist Jewellery. Teardrop Earrings. Leaf Hoop Earrings. Sterling Silver Hoops. Minimalist Design. Bridesmaids Gifts. Leaf Hoop Earrings. Rustic Oxidised Sterling Silver. Minimalist Jewellery. Leaf Hoop Earrings. Oxidised Sterling Silver. Minimalist Jewellery.